Good acoustics provides for a more restful healing environment for patients, a less stressful and distraction-filled workplace for medical professionals, and ultimately better outcomes all around. In healthcare, noise levels have more than doubled in recent years. A 2005 study at one of America’s top hospitals, Johns Hopkins, found that sound levels were, on average, 20 Dba higher than World Health Organisation recommended levels. Patient stress and sleep interruption inhibits their ability to recover, while stress among healthcare professionals diminishes their ability to perform their duties effectively. The resulting miscommunication and errors can have potentially grave consequences. Better acoustic performance is proven to reduce errors and provides a far more pleasant workplace for what is one of the most stressful professional areas. 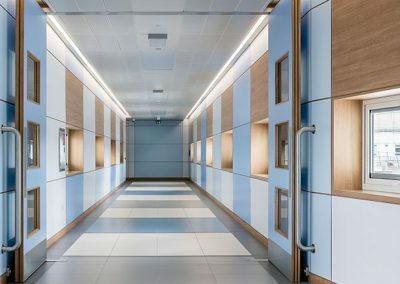 Woodfit have completed projects in various healthcare facilities.